This lovely jewelry set offers a delicate pendant necklace paired with a slightly bolder beaded bracelet. The pieces were inspired by Nancy's Custom Cystic Fibrosis Awareness Graduation Bracelet (B151-II). Purple is nationally recognized as the Cystic Fibrosis Awareness ribbon color. May is designated as Cystic Fibrosis Awareness Month. A simple design. A powerful message. Raise awareness of Cystic Fibrosis with this floating ribbon pendant necklace. Floating along a single strand sterling silver cable chain is a 10mm artisan lampwork white bead with purple awareness ribbon. Pendant necklace is finished with a single amethyst Swarovski Crystal and signature jewelry tag. Measures 18". 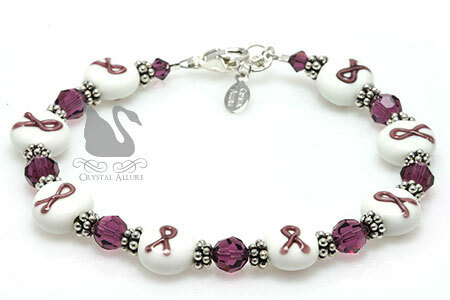 This beautiful handmade beaded bracelet raises awareness of Cystic Fibrosis and features artisan crafted white lampwork glass beads with a purple awareness ribbon, purple Swarovski Crystals and sterling silver Bali. Finished with signature sterling silver jewelry tag. Measures 7-1/2". You can help raise awareness of cystic fibrosis simply by pinning these pieces on Pinterest! Be sure to click on the blog post title before pinning (so the link will be directed right to this post), hover over the image and pin away. Thank you in advance for your support!